System Change not Climate Change: take direct action for climate justice! In 2009, indigenous peoples called for a global mobilisation ‘in defence of mother earth’ on October 12, reclaiming what used to be ‘Columbus Day’. 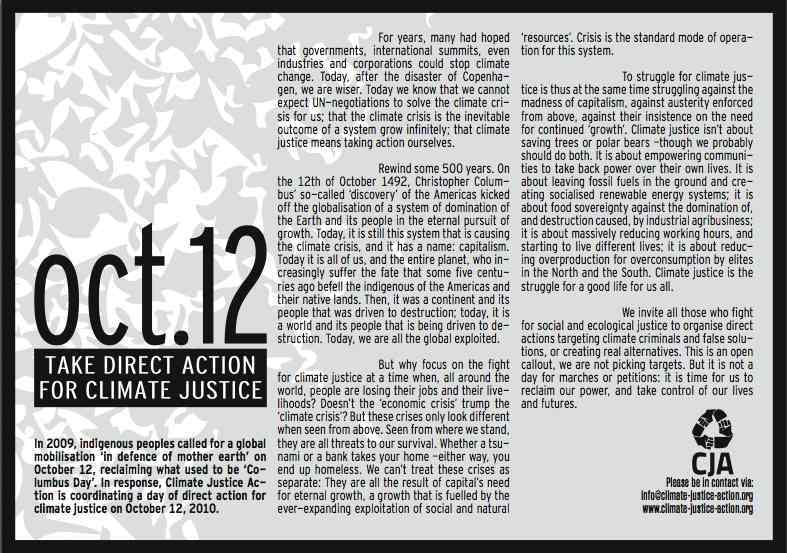 In response, Climate Justice Action is coordinating a day of direct action for climate justice on October 12, 2010. For years, many had hoped that governments, international summits, even industries and corporations could stop climate change. Today, after the disaster of Copenhagen, we are wiser. Today we know that we cannot expect UN-negotiations to solve the climate crisis for us; that the climate crisis is the inevitable outcome of a system growing infinitely; that climate justice means taking action ourselves.